ISTANBUL — In our divided existences, everyone lives their own reality, with their own priorities. Right now, the demand that this city's Hagia Sophia museum be transformed into a mosque has suddenly become the singular issue for a certain segment of the Turkish population. 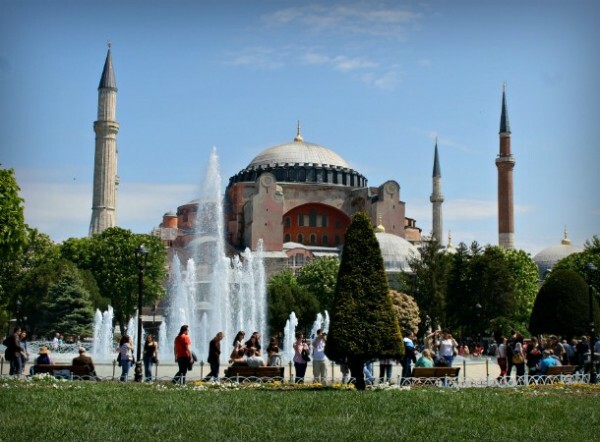 The Anatolia Youth Association announced a gathering at the iconic location with slogans such as “take your prayer mat and come” and “we meet at the Hagia Sophia Mosque for the morning prayer.” And so the group gathered at the Hagia Sophia Square, coming from all around Istanbul and the surrounding province before disbanding around midnight following a collective prayer. “Let the chains break,” was their slogan. “Let Hagia Sophia be open.” This organization, which uses prayer for activism, deserves a closer look — for while the association seems to prioritize religion, this issue is actually quite political. Let us put the debates revolving around it aside for a moment, and remember that the Hagia Sophia is a magical place before all. It offers a state of eternal encounter to the visitors with its wondrous icons and calligraphy referring to both Christianity and Islam. This is a middle world where people can place themselves without any prerequisite identification. It reminds you of the fluidity of life, its changes, and the endless tale of humanity under the watchful eye of angels. However, it also is imbued with codes, and has been a symbol of power since the times of Byzantium. The Hagia Sophia as such holds utterly different meanings and specific importance beyond the universal pleasures that may be tasted by any given individual. As can be seen by the pompous symbolic celebrations and the unending urban renewal projects, Turkey can’t get enough of the continuous re-conquering of Istanbul. Just such a power play is once again at work over the Hagia Sophia. Hagia Sophia accompanied the history of Istanbul since the 4th Century. It was transformed into a mosque in 1453 after the Ottomans conquered the city, and now stands open as a museum since 1935. So, what is this recent activism about? Hagia Sophia always has been a defining symbol for political Islamic movements to score votes and boost reputations. There is the illusion that reopening the place as a mosque would amount to a return to the glory of the days of the Ottoman Empire. On the other hand, the Hagia Sophia is the exact definition of a century-long alternative history for the Orthodox Christians. Therefore the recent debate should be analyzed in the context of the upcoming presidential elections, aware of the possibility that this may be used as a trump card. Bartholomew I saw the matter from this angle and made the following statement to the weekly Agos newspaper on May 29: “We believe the Hagia Sophia should remain as a museum because this magnificent work of architecture with an exceptional place in world civilization should be open to and visited by everybody this way.” He also recalled that it was transformed into a museum by the will of modern Turkey’s founder Mustafa Kemal Ataturk — a decision which was accepted by all sides.